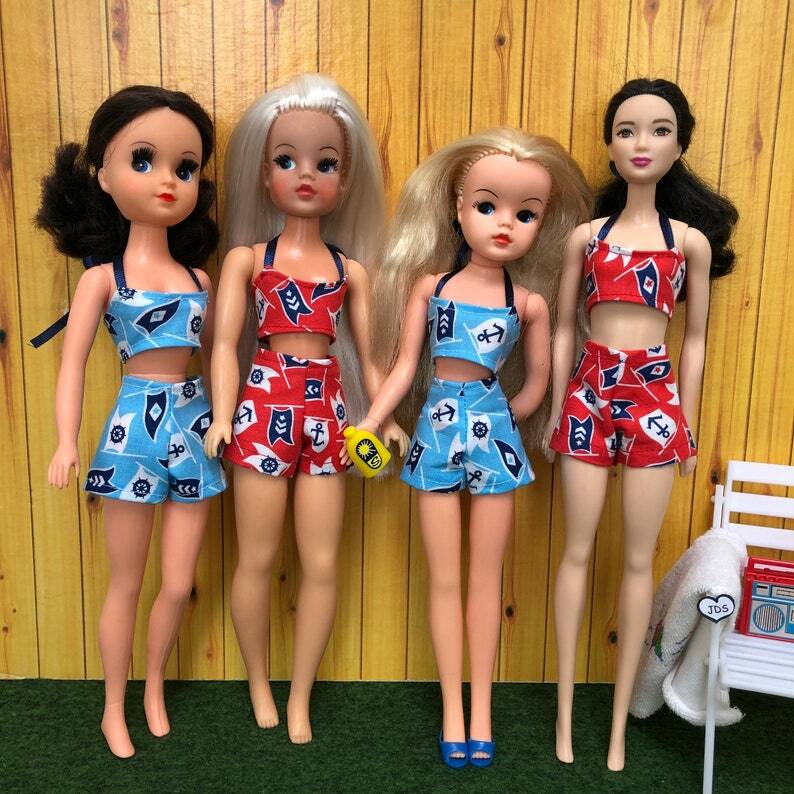 This is a sweet summer outfit for 70s/80s Sindy dolls, Fleur and standard size modern Barbie dolls. It’s only suitable for adult collectors aged 14 and older. The cropped top has a velcro fastening at the back and ribbon ties. The shorts have a snap fastener. Perfect for a vintage look on the beach, yacht, garden or picnic! This outfit is also available in Tammy and Action Girl sizes. Adult collectors Shipshape dress in two sizes. Love this pattern and the shape of the dress. Very good quality. Very happy - thank you. Comfy trouser sets fot Lottie/Finn dolls. Great doll. Really pleased with her. Highly recommended seller. I accept payment by credit card and paypal. Please pay within 3 days. After 3 days if I haven't received payment I will contact you to check you haven't forgotten to pay before I cancel the sale! Hopefully you will love your Jolly Dolly Shop things. However, returns will be accepted for a full refund minus postage as long as the item is returned in the same condition it was posted in within fourteen days of reaching your possession. Once I receive the returned item, I will refund your money. I try to ship readymade items next day, Monday to Friday. I use first class post in the uk. Please contact me if you wish me to post registered, and I will invoice you accordingly.